Iyengar developed a form of yoga that focuses on developing strength, endurance, correct body alignment, as well as flexibility and relaxation. The Iyengar method integrates philosophy, spirituality, and the practice of yoga into everyday living. In The Tree of Yoga, Iyengar offers his thoughts on many practical and philosophical subjects including family life, love and sexuality, health and the healing arts, meditation, death, and Patañjali's Yoga Sutras. This new edition features a foreword by Patricia Walden, a leading American teacher of the Iyengar style. by TKV Desikachar. 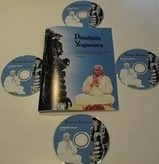 Includes the entire "Yoga Sutras" of Patanjali and features many photos of Sri T. Krishnamacharya. Softcover. This new edition of the classic text contains a new introduction by BKS Iyengar, as well as a foreword by Godfrey Devereux, author of Dynamic Yoga. Includes the original Sanskrit text complete with English translation. Commentary by Swami Muktibodhananda, under the guidance of Swami Satyananda Saraswati. Softcover, 642 pages. 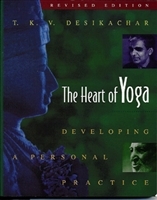 with booklet Introduction by Yogacharya Sri B.K.S. Iyengar and recitation by Pandit Sri S.T. Nagaraj produced by IYNAUS (2004) One disc for each pada/chapter and each track number corresponds to the sutra number. Accompanying booklet of sutras for chanting with facing pages of Devanagari script and roman letter transliteration. Second line of roman letter transliteration indicates breaks in chanting the sutra.